Whether you are planning to sell in the near future or hold onto your property for years, exterior upgrades are a fun way to improve your home’s comfort and curb appeal. The first thing anyone sees when visiting your property is the the outside. Never underestimate the power of a first impression. Make your home something you can be proud of and improve the curb appeal at the same time with these exterior upgrades. Old gutters can get rusty, clogged, and might even start to fall off of your house over time. While most people wouldn’t think of gutters as a place to look for cutting edge technology, major improvements have been made over the last few decades to save you time cleaning your gutters while still offering the same effectiveness. Clogged rain gutters are no fun! No clog gutters come in a few different forms, but the benefits are clear. They look nice and help you avoid getting up on the ladder to clear out the leaves. That’s a big win-win! Paint is a relatively inexpensive home upgrade, but it can completely change the look of a house. 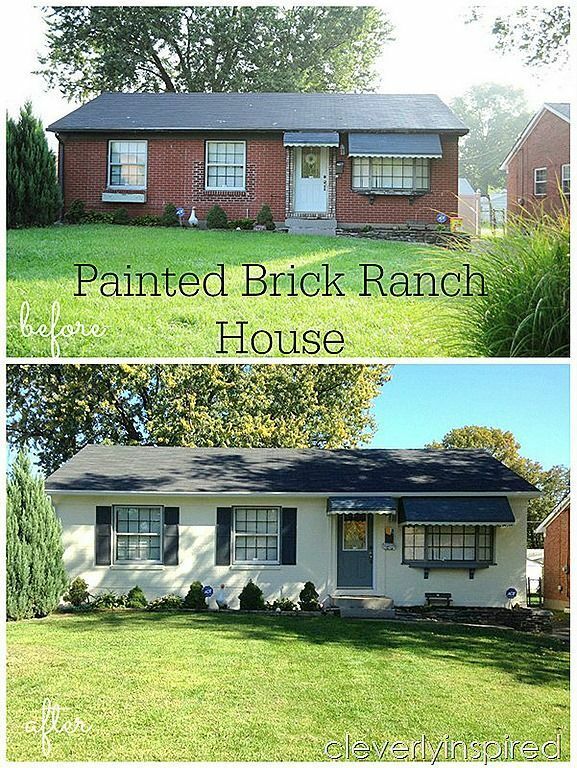 Whether the home is made of wood, brick, or anything else, a new paint job can make a huge difference in a home’s appearance. The home below started as a modest, red brick house that blended in with the neighbors. A little white paint and some new shutters made the house jump out from the rest of the block. Home Advisor reports that the average cost to paint a home runs from $1,000 to $3,000, but the national average comes in around $2,500. Compared to many other home upgrades, this one is quite inexpensive but offers one of the biggest visual upgrades. Sheds have come a long way from just storing tools to acting as a guest house, an office, or other useful function. While this does not add curb appeal, it does make the home more comfortable for you if you plan to stick around for a while. Office sheds offer additional useable space for a home and can double as a guest room if you add a Murphy Bed or a pull-out sofa. While not inexpensive, an office shed can offer a transformative work experience for anyone who works at home full-time or has a company run out of a home office. This type of structure is semi-permanent and can be outfitted with drywall, carpet, power, internet, and HVAC to ensure a comfortable work space. In addition, getting “out of the house” for work can help home based workers avoid distractions, create a space for maximum productivity, and might even offer a substitute for a Man Cave in a home that is otherwise out of space. On a trip to Jerusalem, President Bill Clinton once commented to the Prime Minister that the walls of Jerusalem’s Old City are quite beautiful but difficult to enjoy at night. Shortly after, a new lighting system was installed that illuminates one of the world’s most famous Heritage sites. We can all learn a lesson from this anecdote. The most beautiful parts of your home may be outside, and without the right lighting your family, visitors, and passers by may not be able to see how beautiful your home really is. When was the last time your landscaping was updated? Any project focused on exterior upgrades should include a look at your landscaping. Just like kitchens and bathrooms, landscaping trends change from time to time. If your landscaping looks like 1974, drive by visitors may assume you have shag carpeting and wood paneled walls inside too. There are many parts of a home you can focus on for upgrades. If you are preparing to sell a home in the near future, working with a qualified agent can help you get the most bang for your buck. Experienced agents know what upgrades give you the best return on investment when selling a home. If you are selling a home, start by finding the best agent to work with. AgentHarvest features listings of qualified, vetted agents across the country. Whether you are looking to buy or sell, start your search for the perfect agent at AgentHarvest. This entry was posted in Selling Your House and tagged home improvement projects, home improvements by Eric Rosenberg. Bookmark the permalink.